The context canvas® is the framework we use to help you understand the context. Use this template to map out the trends with your team, and share different perspectives. It will help you to look for drivers outside your own company and have a conversation about the forces that (could) shape your business now and in the future. The context canvas® was created by David Sibbet, of the Grove International. The best way to use this Context Canvas® is to break your team up into smaller sub-teams, and to assign each team a couple of sections of the canvas. You may even want to give the same team that has demographic trends the task to also cover technology trends. Split the team up in sub-teams and assign each team a couple of sections of the canvas. Per sub-team, have a deep meaningful discussion about what is going on in the world regarding the assigned section(s). Don’t forget to write drivers on sticky notes during the discussion. TIP! Don’t let the discussion last longer than 30 minutes! This is long enough to get beyond the obvious. Short enough to prevent repetition. When most teams begin to unpack the context of their product or organization, they take a myopic point of view that is rooted in the here and now. 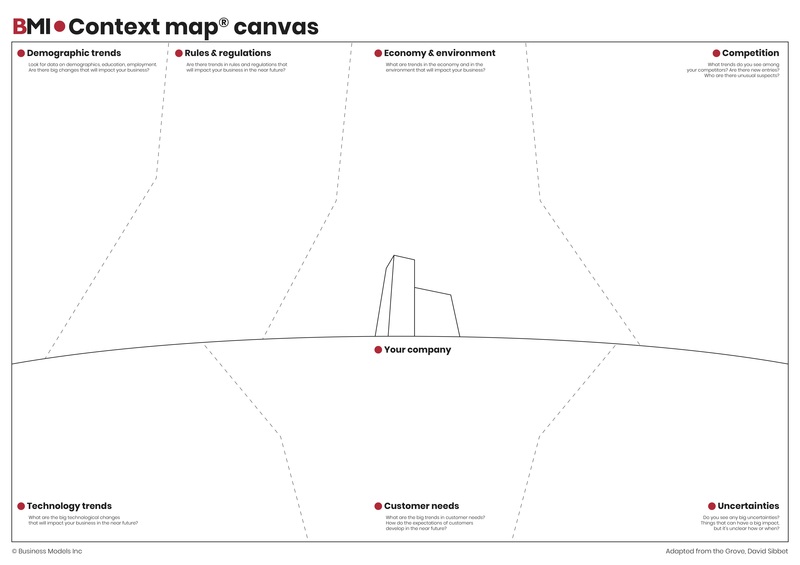 The Context Canvas® is meant to help you and your team expand your thinking beyond the boundaries of your product and organization, to have a deeper conversation about what’s going on in the world and what’s changing that will affect your business in the future. Important to know is that this canvas starts to add real value after you have revisited it a couple of times. The first time, using the canvas will serve to get the top-of-mind trends for your team mapped out. Revisiting, it becomes easier for team members to add evidence for trends, or to actively hunt for trends that you and your team did not identify the first time. Those are the dark horses that can come out of nowhere, simply because they are not on your organization’s map: those are the developments to start to look for. Once all sub-teams are finished discussing and capturing drivers for their sections, have a representative from each team (one at a time) add their sticky notes to the canvas. Take a step back, and look at your brain dump together. Spend 5-10 minutes discussing what you see. Are there topics that jump out because they are on everyone’s radar? Are there things that your colleagues added that surprise you? And, most importantly, find the blind spots. What are the areas do you feel are underdeveloped? Things that were more difficult to fill in your brain dump? Things where team-members disagreed? Where could unknown trends be hiding? What area would you start reading up on? Warning! The sticky notes that are on the map are all assumptions and only reflect what your team knows about the context at this point in time. Meaning, there are going to be blind spots. Together with the entire team, use dot voting to identify the key drivers in your context map. What are the things that, positively or negatively, have the biggest potential to impact your company in the near future? Mark those topics by using a special color sticky note. After the session is finished, leave the map on the wall, so team members and others can see it and comment on it. This map should stay ‘alive’ so you can see how your understanding of the context grows and changes over time. Inspire your team-members to constantly be on the lookout for things to add, or evidence for or against trends actually becoming reality.